Posted August 22nd, 2017 by broomfieldrotary & filed under News. 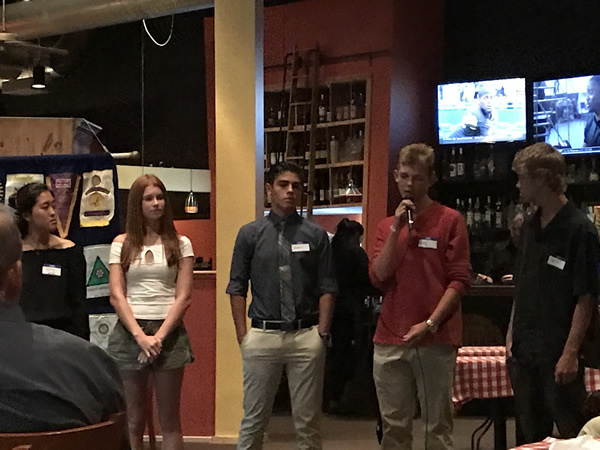 Thursday, August 17th, was the annual meeting scheduled to recognize and celebrate this year’s District Rotary Youth Leadership Award (RYLA) participants. The two one week sessions are held at the YMCA facility in Estes Park and host approximately 350 high school juniors and seniors from Colorado, Nebraska, Idaho, and Wyoming all sponsored by local Rotary Clubs for a week of intense leadership training and fun. 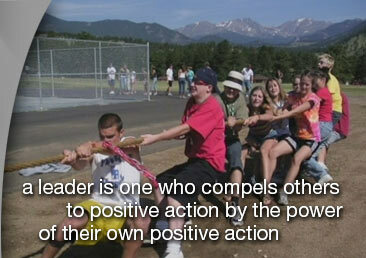 Information about the program is available on the District RYLA website: rmryla.org. Following dinner each of the students present introduced their parents and family members and gave a brief summary of the highlights of their week in June in Estes Park. No one was bored, everyone came back exhausted, all came away with leadership tools and lasting friendships. Posted August 16th, 2017 by broomfieldrotary & filed under News. Many, many thanks to you and all the members at Broomfield Rotary! We received the generous $550.00 check from your foundation last week and our Littleton Rotary Foundation has deposited into the Rotary Peak funding account they set up. Our efforts as Trail Stewards at the trail head on Loveland Pass are a total success. We are thanked repeatedly by visitors for the information we provide and the fact that there is someone up there to answer questions. Cyclists are especially grateful that we offer to have them top off their water bottles from our 5gal ice water cooler. In addition to the public service trail map we provide those interested in hiking on the west side of the pass, we give a commemorative “I Climbed Rotary Peak” button pin to those that complete the hike to the summit. Everyone has been so appreciative and happy to learn more about Rotary. We are encouraging any Rotarians who have 2 to 4 hours to spare to spend time at the trail head as a Rotary Trail Steward. All they need do is contact me or Jim Brook, and we’ll gladly provide them with all the information and materials necessary. It’s easy and rewarding way to greet the public, be helpful, and tell more of the Rotary Story to those who often have no idea what Rotary is. Please share this email with any in your club that may want become involved. I’ll do my best to accompany any of your members who want to serve up there and help them get comfortable in this easy and fun activity. The very best times are first thing in the morning, but any time will work as does any day of the week. Posted April 26th, 2017 by broomfieldrotary & filed under News. 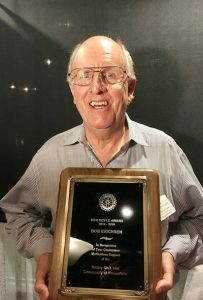 Bob Erichsen was awarded our Club’s coveted Ken Hoyle Award for Rotary Year 2015-2016. The award commemorates Bob’s hard work and great attitude on behalf of our Rotary Club. The Ken Hoyle Award has been awarded yearly since Ken Hoyle, a Charter Member of our Club, passed away in 2001. Ken was a tireless and relentless worker and ambassador for Rotary. Each year the Club singles out a Rotarians for their service and designates them as the Rotarian of the Year. Previous recipients include: Vic Boccard, Bob Davenport, Carl Sauerland, John Santoro, Lew Moier, Gerry Case, Tom Mahoney, Vance Rasmussen, John O’Hayre and John Abboud. Posted March 23rd, 2017 by broomfieldrotary & filed under Broomfield Rotary Events. On Saturday, March 11th, the St. Baldrick’s charity event was held at The Exchange Tavern in Westminster. The St. Baldrick’s Foundation exists to fund childhood cancer research. The event was a fundraising head-shaving event. Retired Chief John O’Hayre, of the Broomfield Rotary club, was a member of the North Metro Fire District team. John personally raised $2,700 and the firefighter team raised $10,000! The event was well attended and was standing room only. Over $21,000 was raised this year at this one location. The Broomfield Rotary thanks John O’Hayre for working so hard to raise the amount he and his team did and for giving up their hair for such a noble charity. Posted March 8th, 2017 by broomfieldrotary & filed under Broomfield Rotary Events, Golf Tournament. The Annual Broomfield Rotary Frank Varra Memorial Police & Fire Golf Tournament raises funds to help provide for the families of police officers and fire fighters who are injured or lost in the line of duty. Posted March 2nd, 2017 by broomfieldrotary & filed under Broomfield Rotary Events. On February 23, 2017, Broomfield Rotary had the honor of hosting Lt. Col Mike Daniels from the Civil Air Patrol as well as C/1st Lieutenant Gage Salyer who is a student at Broomfield High School and a member of the Broomfield Composite Squadron. To learn more about the Civil Air Patrol, please click here to download and view the presentation! The Civil Air Patrol (CAP) is celebrating its 75th anniversary! It was created the week before the Pearl Harbor attack to provide border and coastal patrols, and military training. CAP is the official US Air Force Auxiliary. The CAP mission is Search and Rescue, Disaster Relief, Homeland Security, Counter Drug, Humanitarian Services, and Air Force student ROTC Flights. It serves the local community, our State and the Nation as well as coordinating with other countries. CAP aircraft were the first in the air over New York City after 9/11. The CAP has 52 wings—in every State and territory. The CAP has a very important function with their student Cadet programs, to provide leadership skills, aerospace education, physical fitness, and character development. There are several levels of Cadet squadrons, based on the age of the cadets. Every June the cadets may attend the COWG summer encampment at the US Air Force Academy. There, they have the opportunity to take orientation flights. They fly small single engine aircraft painted in red, white and blue. The Colorado Wing has 34 squadrons and are over 1700 members. They support many community activities and disaster assistance. Their missions save the government a great deal of money, by accomplishing their mission in place of costly main-line military aircraft. Welcome Broomfield High School Interact Club! Posted February 26th, 2017 by broomfieldrotary & filed under News. 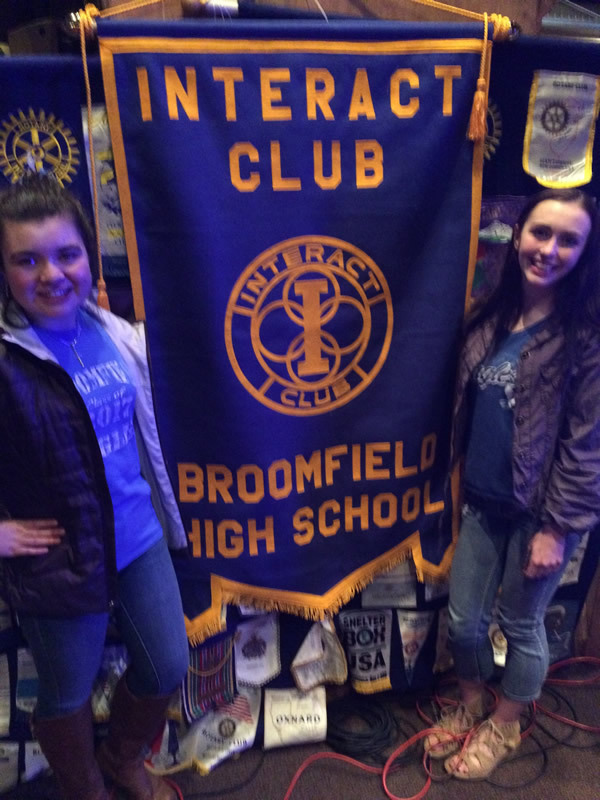 On 2/16/17, the Broomfield Rotary Club welcomed the creation of the Broomfield High School Interact Club. Interact is a Rotary International program for students between the ages of 12 and 18. Students learn the value of service above self and design and conduct various community service projects in Broomfield. Pictured are Carissa Flores, Club President (on the left), and Riley Judd, Publicity Officer (on the right). 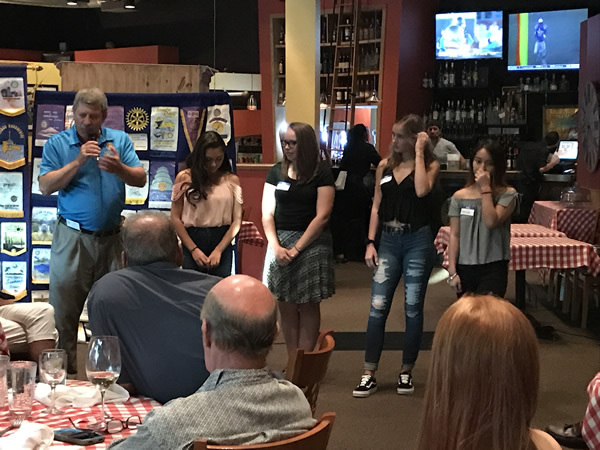 The new Broomfield High School Interact Club has 20 members and they are very excited to give back to our community. Congratulations on the formation of your club! !